I’m completely fascinated by chefs who cook nose-to-tail style – using every part of the animal – like kidneys, brain, feet and more. One of the most front-and-center of these chefs is Chris Cosentino. Often at his restaurant Incanto in San Francisco, he’ll offer a plate called “Odds and Ends,” amazing dishes made out of what many chefs toss. Some say gnarly, I say try it! If you’re an Instagram user, follow Chris – he’s fun. He also founded the artisan salumi company, Boccalone, and they make the most amazing salami and other tasty salted pig parts. I love the orange and fennel. The head salume (the guy who actually makes all of this art), Stephen Pocock, is a Baltimorean and a very cool guy. He also runs his own business called Damn Fine Bacon, which keeps Bay Area bacon enthusiasts quite happy. First question was where to go to get the five pounds of pork belly for the bacon recipe. I immediately thought of the Green Onion Market in Hamilton, which happens to be run by one of Baltimore’s original nose-to-tail guys, Winston Blick of Clementine. These fine folks have been curing their own meats and creating some of the most creative and delicious charcuterie around town for longer than most B’more restaurants. 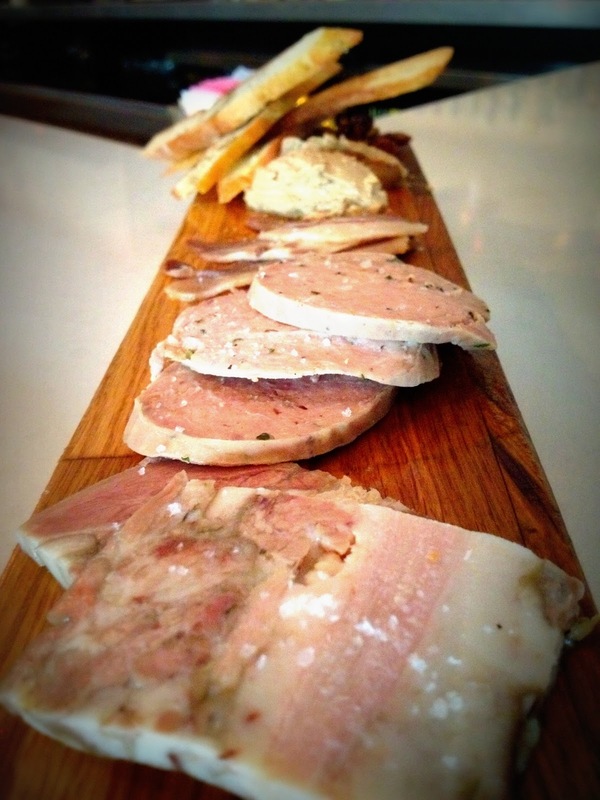 They also sell their own housemade charcuterie to many local restaurants.I have to say that the word charcuterie – basically, the branch of cooking devoted to prepared meat products, such as bacon, ham, sausage, terrines, pâtés, and the like, primarily from pork – sounds so fancy and foreign at first. But it’s really not. It’s a simple thing with a fancy pants name…and to me, it’s just beautiful. Back to the bacon. First, the pork belly was from local pigs raised at Zahradka Farm, a local farm that Clementine works with all the time for the restaurant, market and also a very popular local meat CSA. So, Winston was excited to share their own pig with me, the eager student. I followed a New York Times recipe by John Ruhlman and Brian Polcyn, co-authors of Charcuterie. (I want that book – hint, hint) It was very clear and easy to follow. 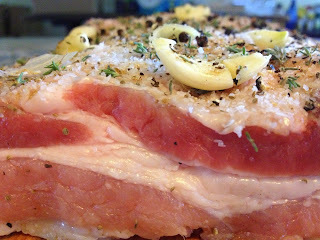 Basically, you choose your flavors, rub them onto the pork belly and then put it in a zip-loc bag in the fridge, turning it over daily. Then, after seven to eight days, you simply cook it in the over on 200 for 90 minutes. You can also use a smoker, but well, I don’t have a smoker and I can’t imagine I will be getting one anytime soon. 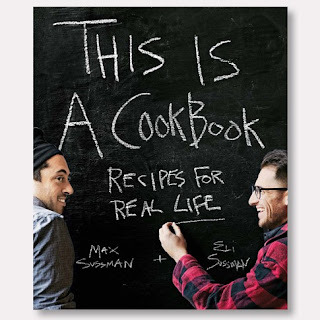 For the recipes and techniques, I also consulted the Sussmans’ cookbook. The only modification I made was to skip one ingredient – pink Himalayan sea salt. It makes the bacon pinkish in color – similar to bacon you’d buy in the store – but it also contains nitrates and Winston said I could definitely skip it at home. He said my bacon would look sort of grey until I cooked it – and he was right, of course. I made one savory bacon rubbed with fresh herbs and garlic and one sweeter kind with brown sugar and coffee. This weekend I used my bacon as a garnish in my grits and in my butternut squash soup – so, so good.What kinds of cooking projects do you like to do? Are you a pasta pro? A bread baker? Or maybe you’re a cheese wiz? (Sorry, that was too easy…) Which end results do you think are worth the time and effort? I feel like bacon is something I will do at home over and over. Really super easy.There is always more to learn. Onward! My husband & I made our own bacon with some cuts from a local farm. We did an adobo glaze, and a habanero rub and smoked them both. While they were great as straight up bacon, my favorite thing was using it like you did, as accents to salads, beans, turnip soup, tomato jam and just a bit on grilled cheese. The bacon lasted forever that way, but we relished it as if it were a main course each time. Thanks for a great post. 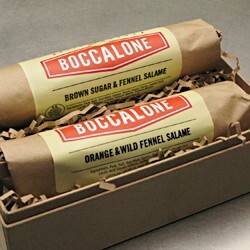 I did buy some of the Boccalone salami from Atwaters, and my Italian family loved it. that’s great! making bacon is the best. keep it up!